Behati Prinsloo makes red carpet return 8 weeks after giving birth | HELLO! Behati Prinsloo made a welcome return to the red carpet at the American Music Awards on Sunday, just eight weeks after giving birth. The Victoria's Secret model, who welcomed daughter Dusty Rose in September, was supporting her husband Adam Levine. Walking the red carpet alone, Behati looked gorgeous in a Vivienne Westwood black mini dress with plunging neckline and an asymmetric hem. The new mum kept her styling simple with a sparkly choker and a pair of strappy black heels, adding tousled hair and smoky eye make-up to complete the look. It was the first high profile outing for Behati since she welcomed her daughter at the end of September. 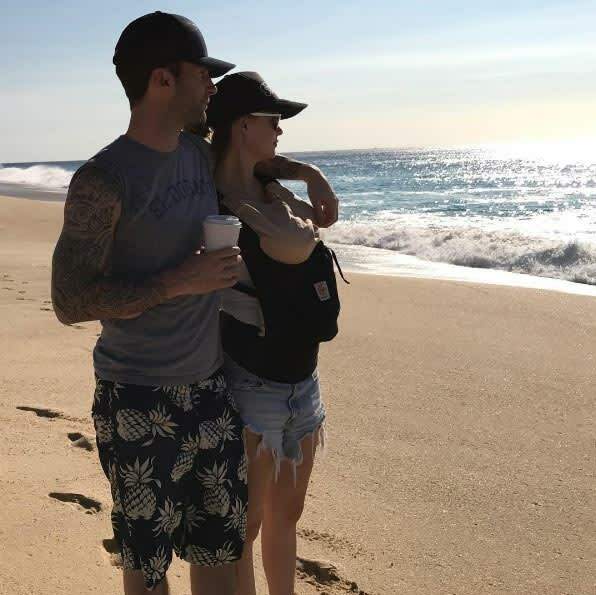 The model announced the new addition to her family on Instagram, with a photo of baby Dusty Rose sleeping on Maroon 5 frontman Adam's chest. "Words can't describe. Dusty Rose Levine 9/21/16," Behati wrote, adding a heart emoticon. Maroon Five frontman Adam, 37, and Behati, 27, married in July 2014 after two years of dating. News of Behati's pregnancy was made public in March, and the following month it was revealed that the couple were expecting a baby girl. Starting a family has always been a top priority for the couple. Behati recently opened up to online magazine Obsev's The Lowdown about becoming a mum: "You know, I've always, since a little girl always wanted a family, a big family. I'm an only child so I wanted like, ten kids for sure." The doting mum is set to miss the annual Victoria's Secret Fashion Show in Paris to focus on motherhood, along with her close friend Candice Swanepoel, who gave birth to a baby boy named Anacã in October.